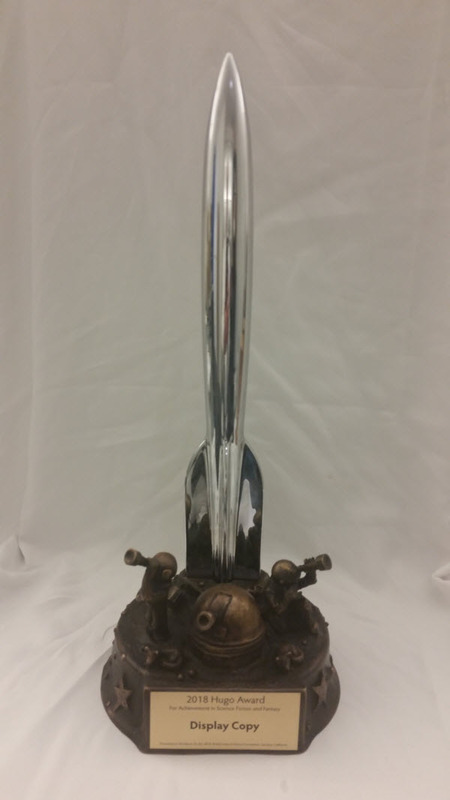 The 2018 Hugo Award base, designed by Sara Felix and Vincent Villafranca. WHEN: The 2018 Hugo Awards Ceremony begins Sunday, August 19, 2018 at 8:00 p.m. North American Pacific Daylight Time (UTC-7). Master of Ceremonies will be Artist Guest of Honor John Picacio. WHERE: McEnery Convention Center Grand Ballroom in San Jose, California. The Ceremony will also be simultaneously shown in Callahan’s Place in the Exhibit Hall in a more relaxed environment where attendees can eat, drink, and socialize during the event. VIDEO: Worldcon 76 San Jose plans to offer live video streaming of the Hugo Awards ceremony via their YouTube channel. TEXT: The Hugo Awards web site will offer text-based coverage of the Hugo Awards ceremony via CoverItLive. The hosts will be Kevin Standlee, Susan de Guardiola, and Cheryl Morgan. You can sign up at the CoverItLive event site for an e-mail notification before the event starts. This entry was posted in Awards, SF & Fantasy Art, Worldcon and tagged Hugo Awards, Hugo base design, Kevin Standlee, Worldcon 76 by Mike Glyer. Bookmark the permalink. What was really striking about The Good Place was the reversal of rank between the episodes from nominations to voting. At a guess: fans of the show would like Michael’s Gambit, as the climax of the first series, but it’s really standing proxy for the series, and doesn’t make much sense on its own, so non-fans weren’t going to appreciate it. Whereas The Trolley Problem is nicely self-contained (except for the bits that aren’t). I still couldn’t see quite what was so exciting about it, though. I had been led to believe that it contained some kind of twist on the Trolley Problem, but it didn’t really. So I remain puzzled. I think you’re right about the ordering of The Good Place episodes. As a fan of the show, I thought Michael’s Gambit was amazing, but I can see how it wouldn’t do much for people who hadn’t watched the whole season. Speaking of Short Form finalists, I want to thank the people who nominated Star Trek: Discovery. I hadn’t been planning to watch it, mostly because I hated the CBS All Access model, but also because I was under the impression that it was some kind of grimdark take on the Federation. When it appeared on the ballot, I decided to give it a try, and by the third or fourth episode, I was completely sold. I still don’t like the All Access model, though! While I have no inside information (maybe they were asked and turned it down) but this is the first Hugo ceremony I remember where neither of the Convention’s Author Guests of Honor (Chelsea Quinn Yarbro and Spider Robinson) presented an award. And there have been past Worldcons where all of the Awards were presented by the Toastmaster/Master of Ceremonies, which was explicitly that person’s responsibility. Regarding the moderation of the text-based coverage: The CoverItLive coverage presented by TheHugoAwards.org (and sponsored in part by UFO/NASFiC 2019/Westercon 72) has always been moderated. It’s the stuff over on YouTube (which is run by the individual Worldcons) that is unmoderated and has had difficulties in the past. Yeah, I thought it was a good thing the YouTube coverage had chat/comments turned off this year. There are better, less troll-filled places to chat.